Reviewing an absorbing new collection of essays from an impressive array of former soldiers, military historians, and academics. 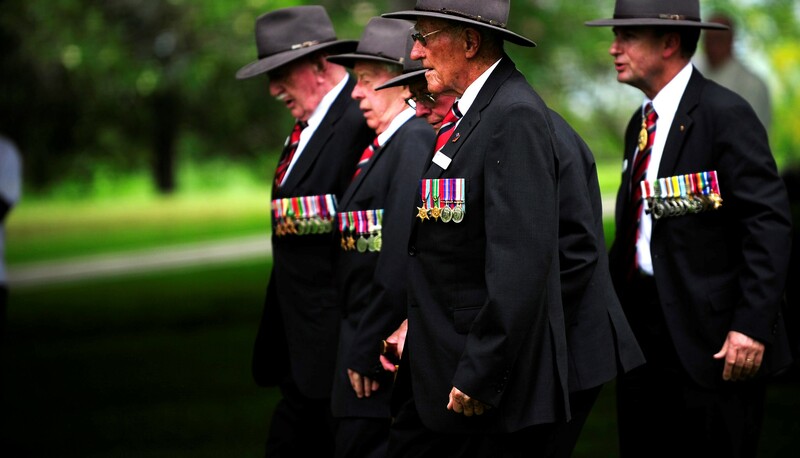 Veterans commemorate the 70th anniversary of the Kokoda campaign at the Port Moresby (Bomana) War Cemetery in 2012. 'Beyond the Legend' is a good sub-title for this absorbing collection of contributions from an impressive array of former soldiers, military historians, academics and others from Australia, the US and Japan, brought together for an international conference at the Australian War Memorial in 2012 to mark the 70th anniversary of the Kokoda campaign. I was at Kokoda in 1992 as the ABC’s Papua New Guinea Correspondent when, to mark the fiftieth anniversary, Australian Prime Minister Paul Keating knelt and kissed the ground and proclaimed that Kokoda should be ranked higher than Gallipoli in the Australian consciousness. Keating argued that the soldiers at Kokoda 'died in defence of Australia' and so, for Australians, 'the battles of Papua New Guinea were the most important ever fought'. The editor of Kokoda: Beyond the Legend, Karl James, a senior historian in the Military History Section at the Australian War Memorial, is not attempting to mount a counter-argument. His opening chapter is called 'Kokoda, the immortal trail'. However, some myths do get busted. One of the first struck down is that the Australians who stopped the Japanese initially faced overwhelming odds. As James notes, the 'story of Kokoda and the fighting in Papua during 1942 has been told and retold with mixed quality and originality in countless websites, articles, books, documentaries and even an Australian film'. In a chapter titled 'Against Overwhelming Odds? ', Peter Williams, an author and former officer with the Departments of Defence and Veterans’ Affairs, examines the numbers on both sides. He says that in the first seven battles, when the Australians and Papua New Guineans (from the Papuan Infantry Battalion) were driven back over 70km in eight weeks, they were rarely outnumbered by the Japanese. For instance, in the Battle for Isurava on 30 August 1942, the Australians and Papuans numbered 2292 while there were 2400 Japanese. Admittedly, the Japanese had towed up to nine artillery guns to that engagement. And there would have been an additional 1100 more Japanese troops there if one of its battalions had not got lost in the jungle and turned up too late. The other fact I found fascinating is how doubtful the Japanese general who commanded the operation was about his force’s ability to capture Port Moresby. Haruki Yoshida, an independent historian who has helped the War Memorial with translations, writes in his chapter, 'Japanese Commanders in Kokoda', that Major General Horii Tomitaro was not keen on the overland operation. At a meeting at the Japanese 17th Army headquarters he was 'encouraged' to be 'positive' about crossing the Owen Stanley Ranges. 'Horii, however, when pressed for his opinion, asserted that the operation seemed impossible.' His major worry was about sustaining supply. Nevertheless, he accepted the order and pursued the operation with vigour. But on 13 September after getting to within 50km of Port Moresby he was effectively ordered to retreat back to the north coast. The reason for this – and for why the Australian retreat then turned into attack – was developments elsewhere. The Battle of the Coral Sea had thwarted the Japanese attack on Port Moresby from the sea and the US Marines were so frustrating the Japanese in the battle for Guadalcanal that Horii’s expected reinforcements were diverted to the Solomons. The Australians also had a significant victory over the Japanese at Milne Bay. What the book does exceedingly well is place the Kokoda campaign in the context of the wider war. There are separate chapters on the Battle of the Coral Sea, Guadalcanal, Milne Bay, the air war over Papua and an analysis of the quality of the Australian and American commanders during the beachhead battles at Buna, Gona and Sanananda after the Japanese had retreated to the north coast of Papua from Kokoda. This last chapter is revealing about the poor opinions these commanders had of each other and of the troops from the other country. Australian Major General George Vasey said of the US 126th Infantry Regiment, which came under his command at Sanananda, that they 'maintained a masterful inactivity'. The American Lieutenant General Robert Eichelberger wrote that 'Vasey does not seem to like the commanders he draws but then maybe if we were to hear from them maybe it would be mutual'. It is appropriate that this book is published this year, the seventy-fifth anniversary of the Kokoda campaign. Photo by Flickr user Department of Veterans' Affairs. Speaking with insiders and outsiders offers a remarkable insight into this famously mysterious company.